I am really lucky to work with some amazingly talented people. People who quilt, people who write, people who do BOTH and walk ((And SEW!!)) along on this journey with me! 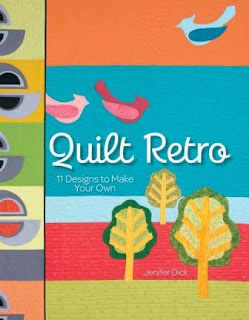 My editor at Kansas City Star, Jennifer, has released her new book called Quilt Retro, and I’m tickled to be a part of her blog tour! You might recognize Jenifer also as the author of 42 Quilts! She’s linked over there in my sidebar. Recently she has been showing ways that “traditional” blocks can go modern! She’ll present the Modern way on “Modern Monday”—the traditional on “Traditional Tuesday” and it’s lots of fun to see what she comes up with. I am so tickled to present to you Jenifer’s “LINOLEUM FLOORS” quilt from Quilt Retro!! Isn’t this FUN!? I love the fresh updated look of the colors. My eyes just want to travel the whole thing and back again. And never fear…..don’t be over-whelmed! You don’t have to drop everything to start this immediately even if you want to! Plan it out! You can build this quilt with leaders & enders in between the projects you already have going. I also love the wide open areas for showing off some really fun quilting. What started out as a simple chain quilt turned into a scrap-fest-lolla-palooza! I have no idea how many different fabrics are in the quilt, but I know it grew exponentially from the original plan. Let me back up. The inspiration for this quilt came from an old quilt book I saw one time. The topic of the book was quilts that survived WWII from Norway. In that book was a simple chain quilt. It was one of those old quilts that was faded badly from over-washing and use. What caught my eye, was that despite the poor condition, an incredible energy came from simple chains of colored squares strung together. I couldn’t shake it from my mind, so I knew I’d have to recreate it! Originally, I wanted to use all white for the background. As I was playing with this on EQ, I realized that it was pretty stark done up that way. So I started throwing in random light neutrals here and there. Well that gave the background so much depth, I knew I was on to something. I kept adding in different shades of fabrics until I got what I wanted. Next, I looked at the chains of color – all running in the same direction. I wondered what would happen if I made some of the chains go in the opposite direction. With a few clicks of the mouse it was done, and so was the design! Perfect! So where did the name come from? The fabrics used for the chains of color are from my retro collection. I believe I used fabrics from the 70s, 80s, 90s, 00s, and today – that’s 50 years of scraps if you’re counting! When it was all laid out, it reminded me of an old-fashioned linoleum floor – maybe because of all the old fabrics. Could she have chosen a better quilt for me to reveal to you? I don’t think so! I’ve now got a purpose for all those vintage calicoes that showed up in my mail box a few days ago! The book features 11 fun quilts all made with different techniques to keep you going and trying new things. Leave me a comment below this post, and I’ll put in you a drawing for a free copy signed by Jenifer herself! I’ll draw for the winner on Saturday, October 8th ---I’ll be traveling to Maryland, but will make it a point to choose a winner that day! SOMEONE will win it, it may as well be you, and you can’t win if you don’t enter by leaving a comment! If you comment as Anonymous, please leave your name and email address at the bottom of your comment so we can reach you. If you are a blogger user that does NOT have your email address visible in your settings, you must also leave your name and email address for us to contact you. Here is the whole line up of the blog tour ---- Be sure to hit them all to comment with your chance to win a copy of Quilt Retro, or whatever other goodie/giveaway is being offered that day on the blog being featured! This way you get to see ALL the quilts featured in the book ---love them all! I am always amazed at the inspiration that some people find. This quilt is an example of that. I'd love to win the book. Thanks for the chance. What a fun quilt. This book looks like it would make a great addition to anyone's library. Looks like a great book....thanks for a chance to win! Oh, Bonnie, what a fun give-away! What a fun blog tour!! I love the opportunity to "meet" others on new-to-me blogs. Great! Would love to win a copy! Thanks for the blogtour! Love the quilt. Thanks for the chance to win! I'd love to have a copy. The quilt you have shown is pretty neat. Also. I want to thank you for the tip on cutting hexie papers. I tracked down a Memories punch and have been happily cutting hexies as the paper comes to my mailbox. This was a great tip!! I recently spent 4 days with Gwen Marston at the Beaver Island Quilt Retreat and we had a discussion one night about Modern Quilts. This is a good example of a more traditional pattern being liberated in a modern and fun way! I would love to win a copy of the book! Please leave a comment on my blog if my name is chosen. Went over to Quilt Retro(Jenifer) awesome! Would love to win her book!!!! Looks like a very interesting book that will spark some new inspiration. Thanks for a chance to win a copy. A wonderful "new" quilt, love the idea of traditional made modern. Thanks for the chance to win what looks like a fantastic book. A quilt designed to use retro fabric is just what I'm looking for. Have been going through my stash/scraps and I also have 50 years worth of fabrics that would be perfect for this pattern. Love this design, but definitely need the book for detailed instructions on the use of the neutrals-what a lovely job she did. A wonderful quilt.....so much fun!!! I would love to win the book....as would everyone who has commented here!!!! Thanks for the opportunity to win, looks like a great book! I always enjoy reading your blog. It gets you motivated every day to get up and get sewing..
What a great quilt! I've checked out her blog on your sidebar and check her out on Tuesdays to see how she has changed the block from Monday to Tuesday. Very interesting. I'd love to win this one! As you said, it might as well be me that wins! Looks like a great book, and what a good quilt to tease with. Love, love, love that quilt! Thanks for the giveaway! Think that would be an easy quilt to do. Thanks for offering it. Robert, in northern Iowa. Cool! I like checking out new blogs for these drawings! Looks like a reqlly fun quilt/author/book to add to my collection. Thank you! I would love to win a copy of this book...enjoying your blog, as usual. Bonnie I'm new to the quilting world. All that fabric it is so fun to work with. Love all the old patterns,to thank that someone thought to bring them back to life. I would love to win the book. Your blog is so wonderful to the new quilter on the block. Thanks again. What a fun quilt. I think this book is a great idea. I'd love to have it. Love Linoleum floors ... werent they so cool back in the days?? :) Cant wait to see the other quilts. Thanks for the chance. WOW. I ususally dont go for pattern books, but eat up technique books, but this one pulls at my heart strings! I am definitely veering in the fresh new looks of traditional! Love your blog! What an awesome quilt! I'd sure love a chance to win that book. Thanks so much! I would LOVE a copy of this book! Thanks for the chance! How wonderful. That quilt could show off some wonderful quilting too. Definitely want my name in the hat for this one! Have another great trip! Fun giveaway, Bonnie! I like to read the process of how the quilt came together. It makes the quilt "speak" to me. Thanks. I love that quilt! So amazing how you can update designs by changing little things. amazing! Would love to have that book as an addition to my addiction! Love the traditional quilt look. Love that quilt. And so simple! But striking. That book needs to be in my library! The quilt reminds me of jelly beans.....love it. Fingers crossed - Would love to win!!!! Thanks for introducing me to Jenifer. Her book looks great! Thanks for the chance to win this book. The quilt is beautiful! Now I'm going to hop around and see the other quilts in this book. This cool book would make a nice addition to my new enlarged sewing room,thanks Bonnie for the chance to win!! Looks like a 'must have' book! Her book looks like a great read and do. Thanks for the chance. Love this quilt! And I've got the scraps to make it. Hope I win. What a darling quilt! Thanks for the opportunity to enter your great giveaway. How fun! I would love to win - thank you for the opportunity. I've learned to love scrap quilting, so what could be better than entering a contest for a book with more scrap quilts. Bonnie you have taught me to love scrap quilting, learning about another quilter who does to can only make it better. I've started your putting together your Ocean Waves and have gotten a friend into making 1/2 square triangles with the Wonder Cut Ruler I was introduced to working on the Ocean Waves. Quilting is a pass it forward kind of thing. Thank you for the opportunity to enter your giveaway. Fun quilt...does this mean the 1970's quilt I have hidden in the back of my closet is back in again?! I am always amazed at a quilt that takes an old pattern and puts new fabric in it. At first I don't like the pattern and then when I see it in the new fabric, I love it. I'd absolutely love a copy of Jenifer's book. I have just gotten back into quilting after a 25 year (!) hiatus (1 1/2 quilts finished), and I am enjoying it immensely. What better way to get back into the swing of things than to go on a blog tour! Thanks Bonnie, this looks fun. What a fun quilt! Yeah, I need to start a new project...NOT. I think I'll wait until after the son's wedding, lol. Can't wait to see all of the other quilts in this book. I love this quilt...and love the idea that you can achieve that look using leaders and enders!! I would love to own this book!! Thanks so much for the chance!! Take care and have a wonderful workshop! This book is right up my alley! Thanks for the chance to win a copy. Would love to get my hands on this. Thanks for the chance to win. What fun , please count me in I'd love to win the book . Looks like a really great book. How fun that the author is also editor of your books. Love that quilt! Thanks for the chance to win the book! What a great quilt. I am a hand dye lover, and they would work up wonderfully in this pattern. I like seeing a modern interpretation of a traditional pattern. It will be interesting to see the variations of each one. I take pictures of tile designs on floors for quilt ideas, so this one really got my attention. Thanks for the opportunity to win the book! I would love to win the book. Thanks for the chance. Oooooooo-la-la I love this quilt! I would loveto win this book. Thank you, Bonnie, for the opportunity AND thank you for all you share with us! I also have about many years of scraps floating around . Love the look of the quilt from new book. Trying to use up not by would like to have book. I love this quilt! Thanks for the chance to win it! I think this pattern is scrumptious. Thanks for the review and best wishes to Jenifer. Love the story that goes along with this quilt...so interesting how things evolve. Thanks for the chance to win! How Bright and Cheerful, my mind is already racing on how to make it into a smaller quilt for Quilts for Kids! This is such a "happy" quilt, it's light and fun looking. I'd love to win this book,if only to make that quilt. Thanks for the opportunity. wonderful quilt... I'll be keeping my eyes open for this book. Can I turn my floor into that quilt after I make it? How fun would that be, to have a patchwork linoleum kitchen floor? Thanks, Bonnie, for showcasing such a cool book, and for the chance to win one! I love that scrappy background.....and yeah, this would make a great leader/ender project! I'd LOVE to win this book! Thank you for the opportunity. Looks like a fun book! I'd love to make me a Linoleum Floor! Love the quilt. Looks like a stashbuster to me! This quilt looks like so much fun. I am sure the rest of the book will be the same. I'd love to have a copy. I love that quilt! You're so right about the eye just traveling over it back and forth! So much to look at in such a simple looking quilt! That's a great quilt and I love the use of various neutrals for the background. Definitely a great way to use some scraps! Thanks for the chance to win! Linoleum Floors would be a great quilt for me to make for my thoroughly modern daughter! I've not seen 'chains' in this configuration. It's an eye-catching design. I could live with this one for a long time. What a neat book! I would love to win it! Love this quilt - heaven knows I have a stash of fabrics that could star in it perfectly. Thanks for the great book review and giveaway opportunity. Sounds like a wonderful book! I love the idea og converting traditional patterns into modern quilts. Hi Bonnie! Just what I need - more inspiration! Looks like a book I would really enjoy. Thanks for the opportunity to win. What a lovely quilt!!! This book is going to be too much fun! Thanks again for offering a give-a-way. I love the quilt, and the background fabrics give me such inspiration. Thanks for introducing me to this quilter. I am thrilled to have a chance to win her book. Love the quilt and the great way to use scraps.Thanks for the chance!! How fun does that book look? Looks like a fun book with lots of inspiration for fun quilts. It would make a nice addition to my quilting library. I hope I win! Looks like a GREAT book and I would love to win it. Thanks for the chance! Thanks for the opportunity to win! Looks like a great book! And good luck at the doc's with the exams and tests! I really love this look. If the other ideas in the book are as great it is definitely a book I want to own and work from. Thanks for the chance to win it. Such a simple yet stunning quilt. I'm always amazed at how designers keep coming up with ideas for beautiful quilts. Beautiful quilt - looks like a book I have to have! Love the quilt and would love to have the book. This looks like a book I need in my arsenal of patterns. I love scrappy, retro and modern! Thanks for the chance to win it. I don't have the retro fabrics, but I can see that this design would look great made up in any scraps. Count me in! Love it when a simple design has such impact! Oh my goodness, I LOVE vintage! ('70s is vintage? I graduated high school in '75 - what does that make me?? LOL) This books looks wonderful. Thanks for the opportunity. Count me in! I always love a giveaway, and this book looks like one that I would love to own. What a sweet looking quilt! and can be done leader/ender style, what could be better! What a fun giveaway - thanks so much for the opportunity! How sweet! I've always loved the chain setting for quilts and this "updated" version is really inspiring. I'd love to have this book. Thanks. Bonnie. Thank you, Bonnie, for the effort you take in writing this awesome blog every day, it's my favourite. And thanks for the opportunity to win this terrific looking book! Can't wait to see what other quilt ideas are in that book. Thanks Bonnie. for the chance to win the book! What a great book! I love seeing the same quilt done different ways. Thanks for the chance to win. A very fresh looking quilt. Just my cup of tea. Thanks so much for the chance to win the book. LOVE it! I love the idea that you can still go modern and scrappy at the same time ... looks like a wonderful book. Thank you for the great give-away! Always looking for a new twist to do older blocks! I'd love to win a copy of this book. I love this pattern... what a neat way to use leftover scraps of colors. I would love to win this book. I would love to win this book if for no other reason than to make this quilt! I bet the rest of the projects included are just as fun. I can see myself making this quilt. Great idea for a book. I would love to win it. Thanks for the giveaway. I have yet to win any giveaway I've entered. Maybe this one will be my lucky one. Amazing quilt to start with. Looks like one my grandmother made. I would really like to have the book to give it a try. Thank you for the chance to win. Thanks for the chance to win this book. It will be the perfect addition to my library! What a great looking quilt! I love how the new "modern" patterns give traditional settings such a fresh look. That's what will keep quilting alive. Thanks for the chance to win Jennifer's book. thanks to you for the chance to win. I love scrappy quilts and I love modern quilts. What a great marriage. I love how vibrant this quilt is. Looks like a neat book. Wow! If that quilt is an indication of the rest of the book, I'd love to have it. Thanks for having the giveaway! A long shot, I know, but I'd love to win a copy of the book. I've always been a traditional quilter, but lately I find myself drawn more and more to modern quilts. Sign me up to win this Book, I have fabrics for many era's now..I'm getting older. When I saw the video of "Stitched" last week there was a song lyric that hit me, if you take pictures of bathroom floors or something like that. I would love to use my scraps for a quilt like this. This book looks great! The linoleum tiles quilt looks like it could use scraps which are my favorite type of quilts. Thanks for the chance to win. Wow, this is great! I just discovered Jennifer's blog recently and am following along for the Monday and Tuesday blocks. It's really fun to see the blocks she chooses and the modern/traditional differences. I'd love to win her book! I love the mix of nostalgia and contemporary - the book looks fantastic! Love the updated look of this quilt. And I'm so pleased that I came across the blog tour and can check in each day. I would love to win and am inspired by anyone who can do artistic things with fabric! Love this quilt and am looking for another leader n' ender right now. Thanks for hosting the give-away for this book. I hope I win. Beautiful quilt! I bet the book is full of great patterns! NEAT BOOK! EAGER TO SEE IT! I know that we would enjoy using this book and making some of the quilts. Thanks for the chance. LINOLEUM FLOORING is a wonderful quilt pattern. what a pattern! thanx for the review, and the opporutunity to add to my [skimppy] quilt book collection. I am totally intrigued by this quilt. It truly is amazing how people work these small pieces of material into such works of art. I think this is special and took a lot of work. I cannot wait to get the book. Oh – this looks like just what I’ve been needing. I’m fairly new to quilting, and I’ve been a bit overwhelmed thinking about applique, but the photos you’ve included in your post make it look as though it really IS step-by-step which isn’t what I’m finding elsewhere. I’d love to win and see if I can tackle applique. Thanks! I love Linoleum Floors and would love to win. Thanks for the chance! Glad you were on her blog tour so I'd hear about her new book. Congrats Jennifer! I like your idea of the vintage calicos for that quilt. That would be definitely retro/modern. The book sounds great for new ideas. We can never have enough new quilting ideas. Thank you. I would so love to win this book! Love the colors. Judging by the quilt you featured here, I would definitely like to have this book! Thank you for the chance to win! oooo Pick me Pick me !!! This looks awesome! Count me in please. I'd love to win this. Thanks! Love the quilt featured. Looks like a great book, count me in! Thanks for the chance to win, it looks like a great book!!! Some of us have always been retro, so of course I love the idea behind this book! Thanks for the opportunity to win it. I love that quilt! I'm big into pixel quilts so that pattern in particular is right up my alley! would love to win Jennifer's book. Love the vintage look and I do have some vintage fabrics! Holy Moley! This books looks like it was written for me. I have been trying to figure out how to modernize traditional quilts. I can see how this would make a great leader and ender project. And the colors really pop, it's very tempting! I'll have to check out the book. I really like this quilt! I had to take a second look at it to see all of the other "light" colors in the background. The book sounds like a lot of fun. Thanks for the giveaway. Yummy patterns and more great quilts to make! Thanks of a chance to win a book. Halloween Interview with Pat Sloan! Star Struck in Santa Fe! Evening Edition….Yup, a Free Kindle Book! Halloween Cuteness! Free Witch Pattern! A Day in Santa Fe! Monday Evening Edition! Free Kindle Cook Book! Sunday Night Edition! Free Kindle Book! Chicken Soup for the Cold! Evening Edition, Radio Show, & Free Kindle Book! Quilt Camp at the Country Club Inn! Threads Galore & Quilt Inn! And I drove and drove…..
Pineapple Blossoms in Oak Ridge!